Pete opened a bottle of wine last night and I jumped on him. Not literally. Don't throw the cork out, I yelled. Literally. I wanted to make sure he heard me. I need it to make something. He handed it over and, instead of telling me our apartment was turning into a garbage pail because I'm saving miscellaneous items for my craft projects, he told me it wasn't exactly cork and hoped that it would work. Work for what, you ask. Oh, my crazy idea for table cards. 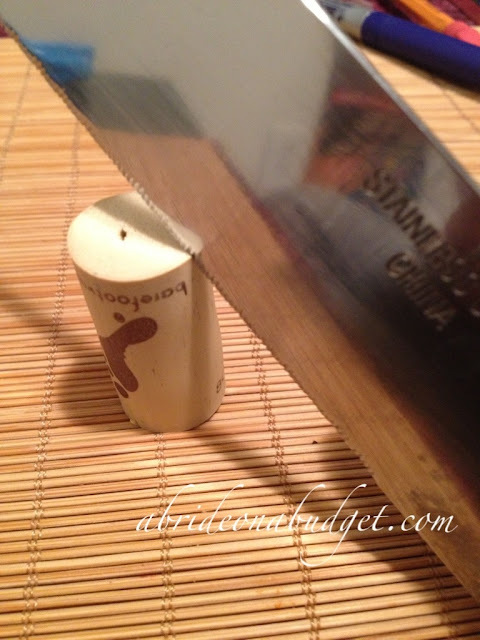 If you want to make these wine cork table cards, you should probably start drinking a lot of wine. Or, in case you can't drink that much, you'll be happy to know that you can actually buy recycled wine corks in bulk on Amazon. It's a lot cheaper than buying all the wine just for the wine corks. I happened to have all these items on hand, so I paid a whopping nothing. 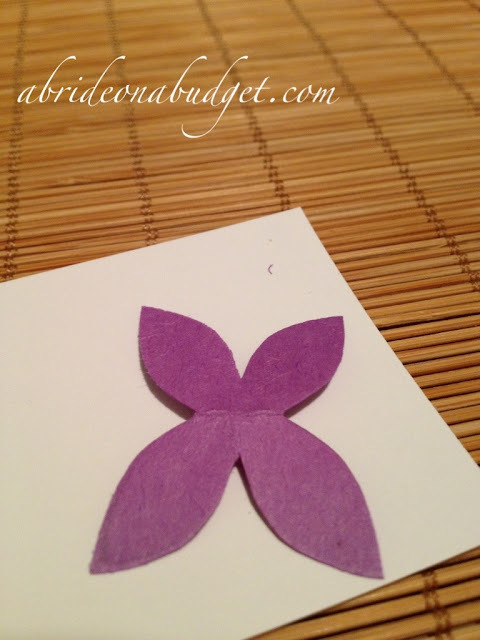 Cut the piece of construction paper in any shape you want. 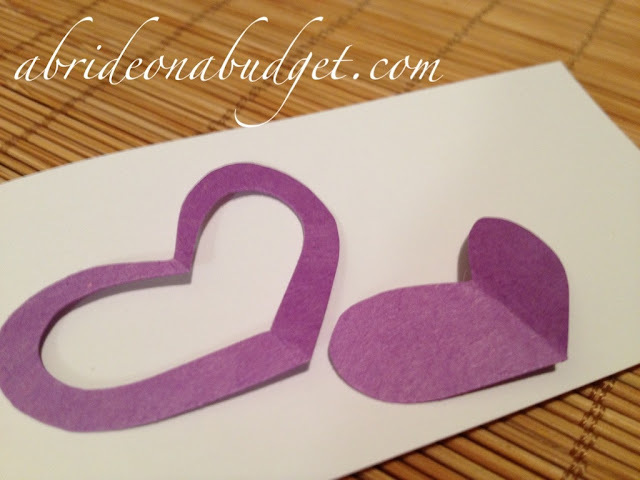 I went with a heart, which is wedding appropriate ... and very easy to cut. 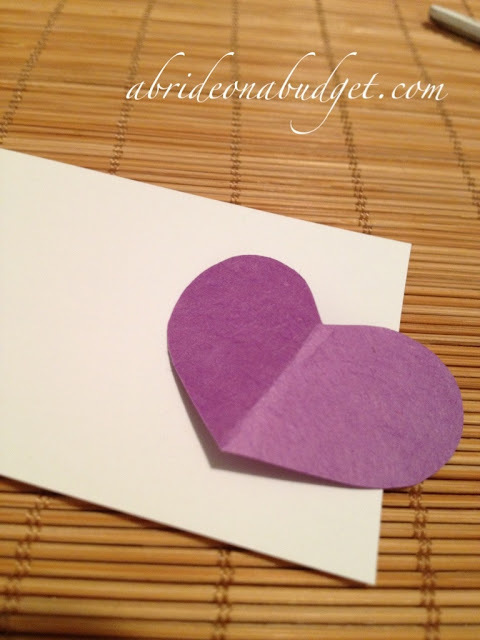 But a solid heart, well that looked more preschool Valentine's Day party rather than elegant wedding. So I had to jazz it up a bit. I cut out the inside of the heart and, I don't know, somehow this made it a bit more elegant. Feel free to cut whatever shape you'd like. Circle, square, snowflake. Whatever works. 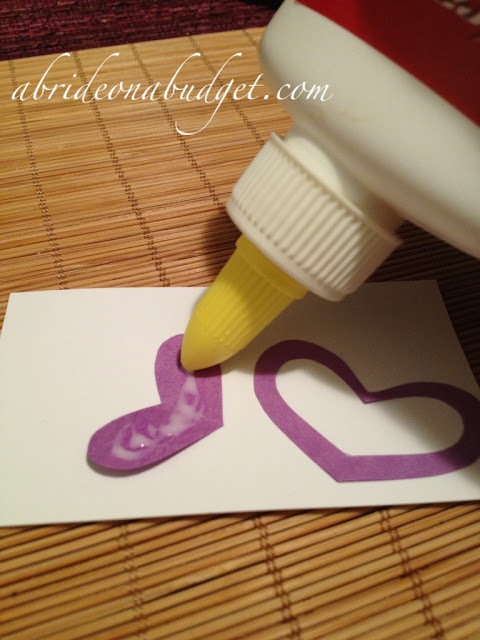 If you're not so handy with scissors, use a heart-shaped craft punch. It'll make sure every card is uniform too. 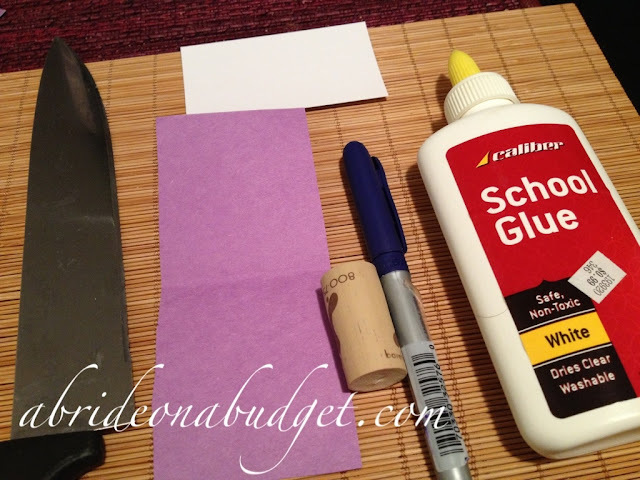 Glue the construction paper cut out. Affix it wherever appropriate on your business card. Follow suit with the rest of the design. 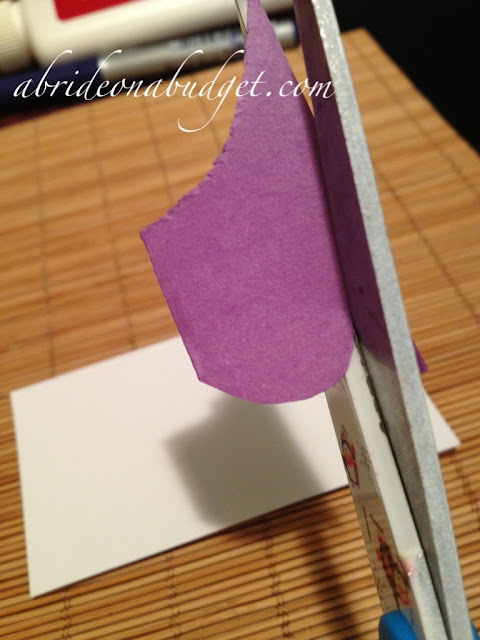 I cut a flower too, just because I thought the tables would look pretty if the cards had different designs. 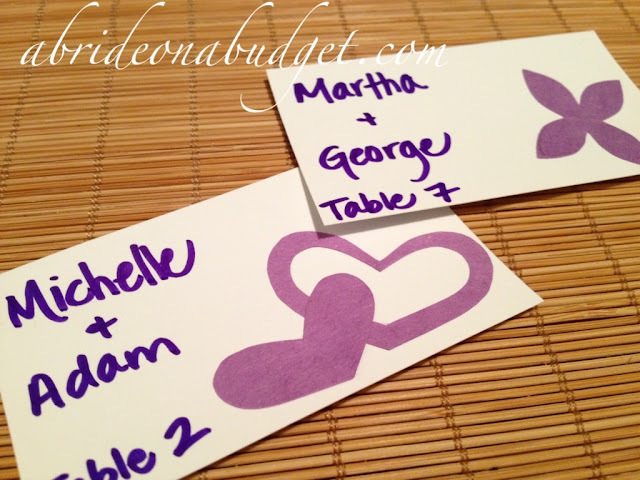 Consider one design per table instead of just haphazardly scribbling names on cards. 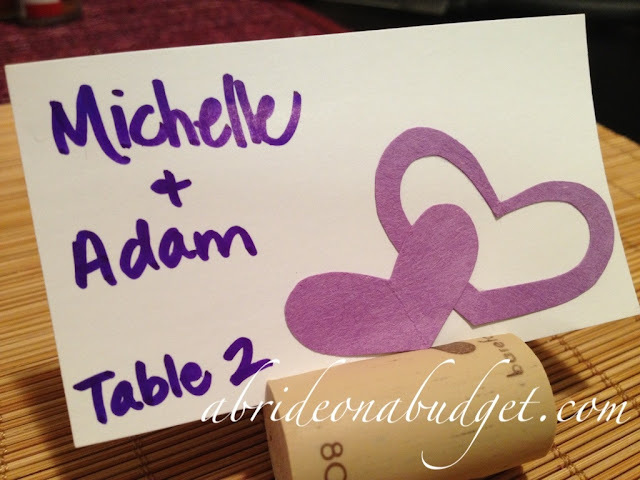 Then, have the designs coordinate with your centerpieces so it's a lot easier for people to find their seats. 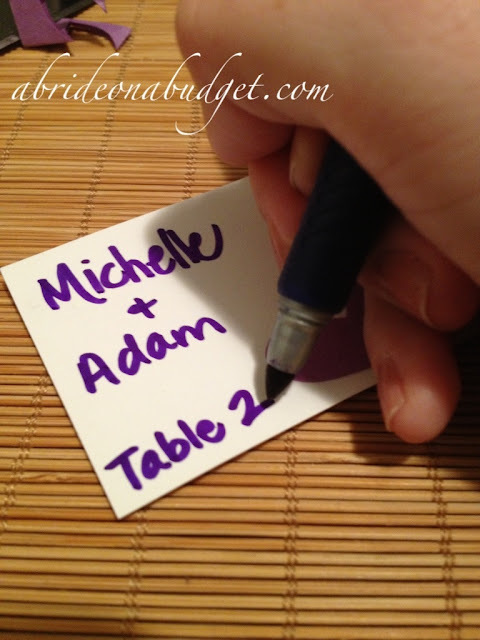 Write the names of your guests on the side opposite the design. And then, if you're me, stand back and realize that this fat permanent ink marker probably wasn't the best writing utensil to choose. 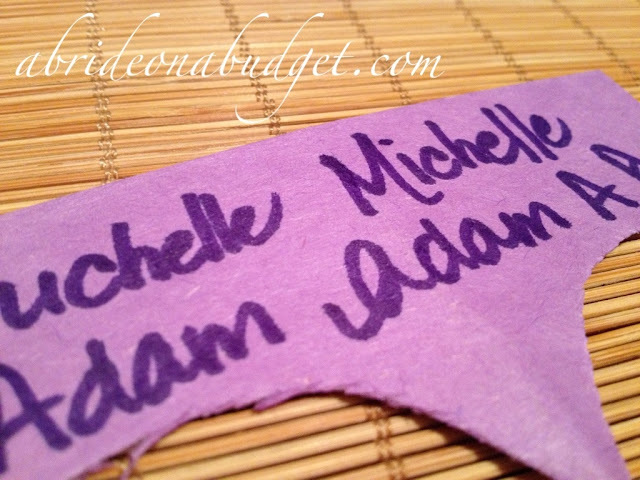 Yes, it's purple so it matched, but look how sloppy my handwriting looks. And I actually practiced before writing on the card. Oh well. Martha and George came out a little neater, but I would definitely use a different pen if I was actually making these for a wedding. Now comes the dangerous part. Cutting the cork. As I mentioned before, this isn't exactly a cork. 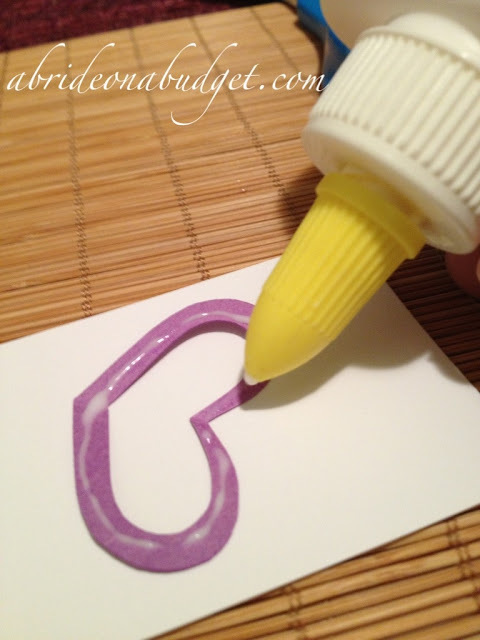 It's more of a rubber stopper, so it wasn't that easy to cut. 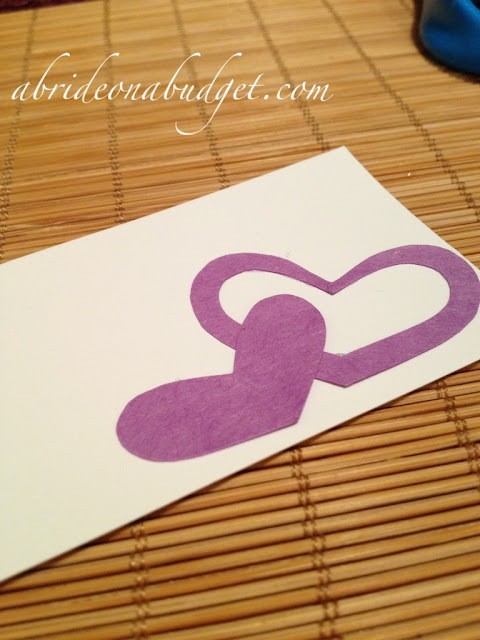 It probably would have been a lot easier with an X-acto knife, but I didn't have one handy. You really need to cut into the cork, deep enough for it to hold the card in place. You don't want a shallow gash that gives the cards the opportunity to fall out. Stick the card in the slit (making sure that the name, the table number, and your beautiful design as all visible) and line these wine cork table cards up at your wedding. And, if you are drinking a ton of wine to get these wine corks, you can turn them into twine-wrapped wine bottles or glittered wine bottles. 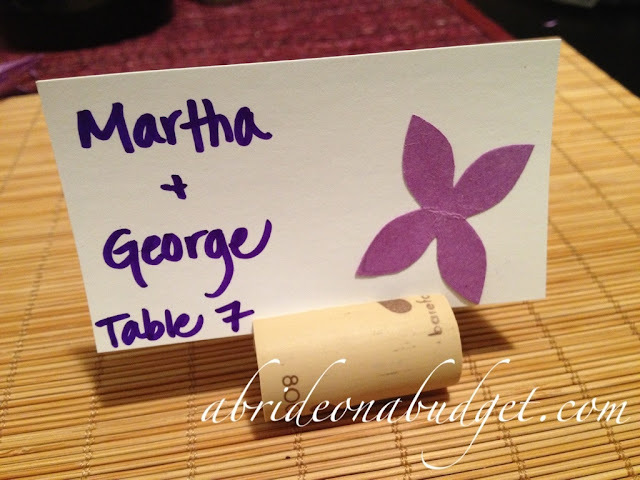 BRIDAL BABBLE: What shapes would you cut if you were making these wine cork table cards? Those are really cute! But that's A LOT of wine you guys are going to have to drink! 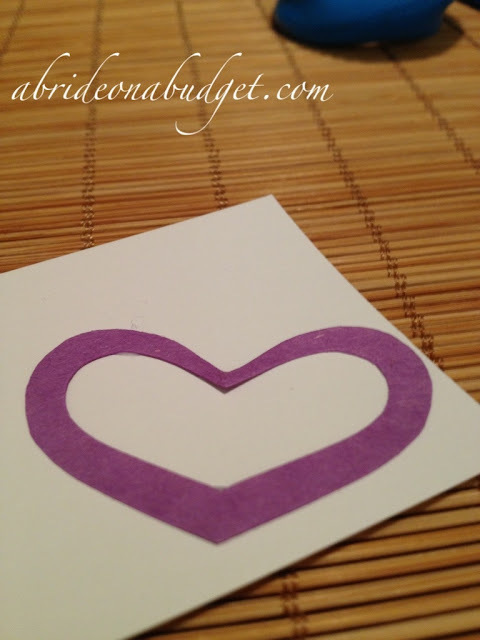 This is a really cute (and creative) way to do place settings! 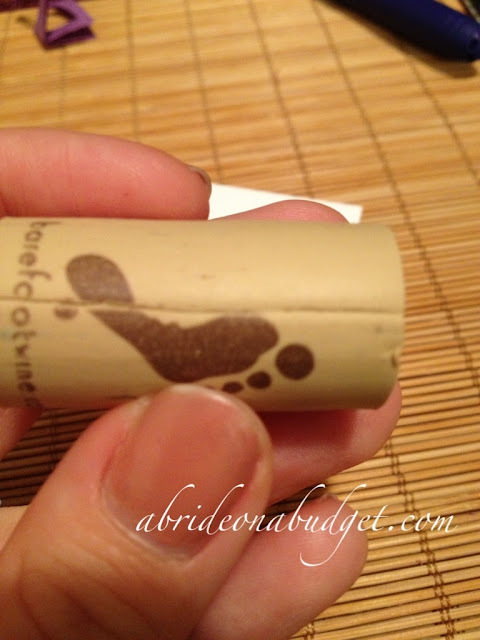 I love the wine cork idea! How cute and a perfect way to celebrate.